Effortlessly and effectively label all the pipes, valves and even pieces of equipment around your facility with custom metal tags. At Seton, we offer dozens of different types of custom metallic tags to suit all your needs. Choose from aluminum, brass or stainless steel options, including tags that can be written on with a pen or come embossed or engraved with your specific numbering or wording. We also offer Custom Etched Aluminum Tags that feature your custom wording, your company logo and even a serial number. These tags not only look professional, but they are guaranteed to withstand temperatures as high as 400°F. There are dozens of different uses for custom metal tags; use them to label pipes and their corresponding valves, or even to mark or label pieces of equipment. At Seton, we offer dozens of different types of custom metal tags in a variety of materials, including brass, aluminum and stainless steel. 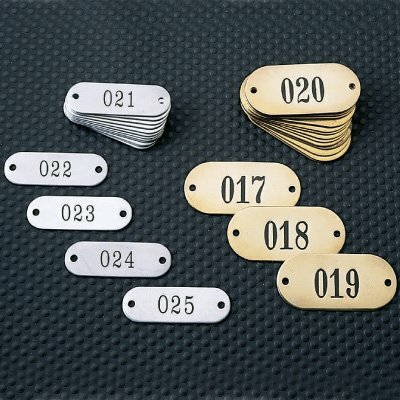 If you're looking for custom metallic tags to keep track of your property, consider using Etched Aluminum Tags that display "Property Number" and stamped sequential numbering. Unfilled numbers are guaranteed to not wear away, and what's more is that these tags are able to withstand temperatures up to 400°F. If you're looking for a quality, durable custom metal tag, look no further than Seton. Not only do we have the inventory you're looking for, but we offer quality that can't be beat.